Earlier this year, after Apple released the first 64-bit chip for smartphones, a Qualcomm spokesperson claimed the A7 processor was a "marketing gimmick" and that there is "zero benefit" to the consumer from the chip. Those comments were later walked back before the executive who made them was reassigned. Now, Dan Lyons -- the former Fake Steve Jobs and tech columnist -- writes at HubSpot that the A7 chip "hit [Qualcomm] in the gut", according to an unnamed Qualcomm employee. "The 64-bit Apple chip hit us in the gut," says the Qualcomm employee. "Not just us, but everyone, really. We were slack-jawed, and stunned, and unprepared. It’s not that big a performance difference right now, since most current software won’t benefit. But in Spinal Tap terms it’s like, 32 more, and now everyone wants it." "The roadmap for 64-bit was nowhere close to Apple’s, since no one thought it was that essential," the Qualcomm insider says. "The evolution was going to be steady. Sure, it’s neat, it’s the future, but it’s not really essential for conditions now." But once Apple introduced a 64-bit processor, all the other phone-makers wanted one too. "Apple kicked everybody in the balls with this. It’s being downplayed, but it set off panic in the industry." Since the launch of the iPhone 5s, Apple has gone on to put its flagship A7 64-bit processor in the latest iPad and iPad mini models, in addition to the iPhone 5s. 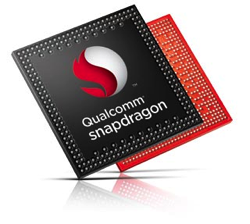 Both Samsung and Qualcomm have announced that their future smartphone processors will be 64-bit. For Apple, though many apps will not take advantage of the increased speed of the A7 processor, some apps -- Djay and Vjay for example -- do see significant speed improvements with the new processor. The A7 is a power house but imho 64-bit is useless with 1GB Ram. When are people going to get that moving to 64-bit improves performance regardless of how much RAM the device has? How often do we see similar reports in the press? 1. Apple releases a new product. 2. Competitors gripe that it's a worthless upgrade. 3. Apple sells tons of devices. 4. Competitors rush to make their devices like Apple's. It's already been established that there are more benefits to a 64-bit architecture than an increase in RAM capacity. "The roadmap for 64-bit was nowhere close to Apple's, since no one thought it was that essential," the Qualcomm insider says. "The evolution was going to be steady. Sure, it's neat, it's the future, but it's not really essential for conditions now." I can assure those guys that Apple doesn't consider it essential to have it now either. However, the main difference is that unlike those guys, Apple's main goal is to streamline the entire development process for iOS and development tools to handle the transition to 64-bit down the line smoothly. So, when iOS devices do get 4GB in 6-8 years, it's not going to be a big deal for their developers. Apple's pretty much one of the rare companies that already have the experience and skills to pull it off without major issues (68x > PPC, PPC > Intel). For anybody else climaining there's no point of A7 without the extra RAM, A7 is far more than just a 64-bit chip, it has a completely new arch that will speed up many type of processes without having the extra memory. Safari issues are software issues first, not hardware issues. Apple never really optimized Safari to use the memory efficiently, they haven't done it in a few years. Still think 64 bit is stupid. My iPad Air can't keep more than 1.5 tabs loaded at a time. It is actually worse than the iPad 3 and iPhone 5 in Safari. Whatever performance benefits there are are outweighed by the pointless extra ram usage. Apple is smarter than you Qualcomm. There is a reason that Snapdragon is affectionately known as Crapdragon. Now you got a 64-bit chip with no 64-bit OS...yay? The story of Apple's life.